These are the words that opened up every episode of Star Trek, highlighting the overall theme of the series. Creator Gene Roddenberry conceived of a program that would subtly deal with present-day issues in an idealized future setting showcasing what humanity could develop into if it learned from mistakes of the past. At the center of his idea was the United Federation of Planets, or simply “the Federation,” which was a coalition of planets from various galaxies working together for the betterment of all sentient beings, like a space-aged version of the United Nations. Their exploratory, peacekeeping and military arm was Starfleet, which employed a wide range of starships to carry out various missions around known space. Advanced technology introduced included energy-based phaser weapons, portable communicators (imagine a precursor to flip-open cell phones), tricorders which could read and analyze anything, transporters which could break anything down to the molecular level and reassemble them in another location, protective deflector shields and a warp drive that allowed starships to travel at great speeds. Roddenberry was greatly influenced by Wagon Train, which his pitches for the series often compared the two works, and by Gulliver’s Travels. He intended each episode to act as a suspenseful adventure and a morality tale. In 1964, he presented a brief treatment proposal to Desilu Productions, and after some reworking the series was pitched to NBC. NBC was interested and commissioned the creation of a pilot. 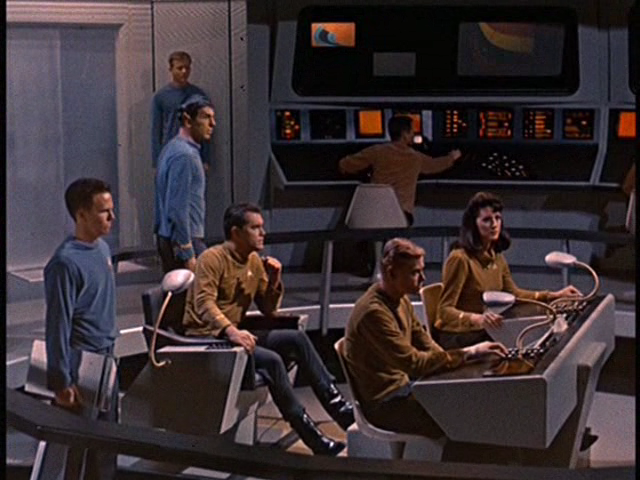 It focused on the adventures of the crew of the USS Enterprise: Captain Christopher Pike (Jeffrey Hunter); first officer Number One (Majel Barrett); Vulcan officer Mr. Spock (Leonard Nimoy); Lt. Jose Tyler (Peter Duryea) and Yeoman J.M. Colt (Laurel Goodwin). The novelization of "The Cage." The pilot, known as “The Cage,” was finished and screened for NBC in 1965. While they found it “too cerebral,” “too intellectual,” and “too slow” with “not enough action.” they were convinced by Lucille Ball, owner of Desilu and believer in the project, to make the unprecedented move of commissioning a second pilot. 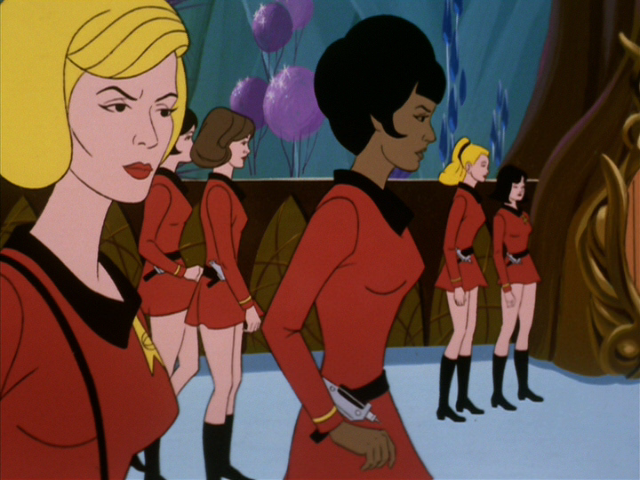 Roddenberry wrote two outlines, which became later episodes of the series known as “Mudd’s Women” and “The Omega Glory,” and commissioned Samuel Peeples to write a third for consideration. 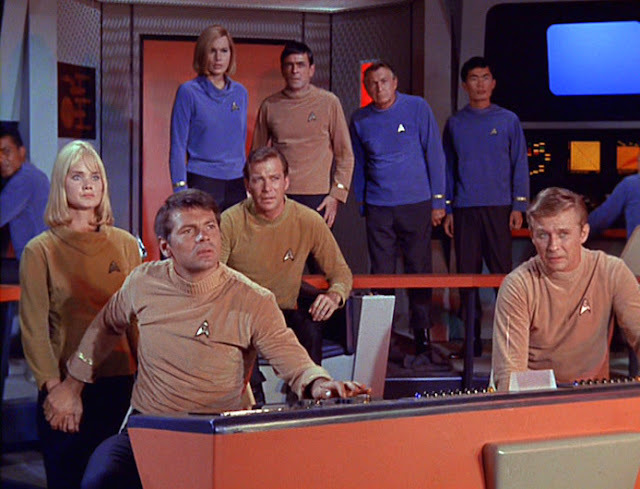 Peeples’ script “Where No Man Has Gone Before” was selected by NBC to be the new pilot (parts of the original were used in the two-part episode “The Menagerie”). 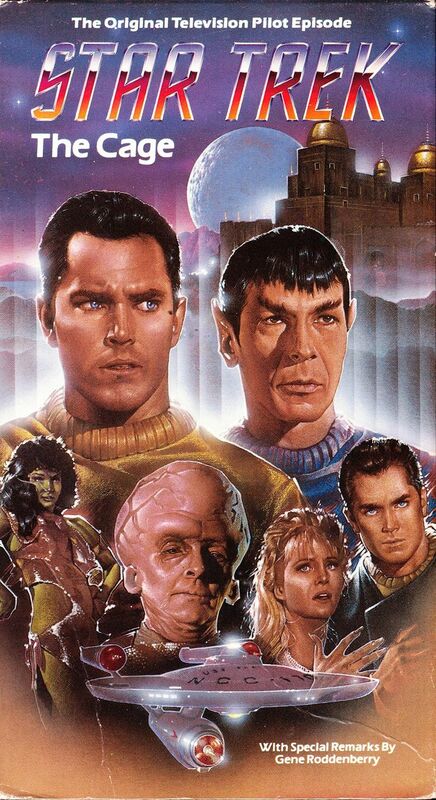 The entire cast was replaced, save for Nimoy’s Spock despite NBC’s petitioning for his removal due to his “satanic” appearance. Originally presented with youthful energy, he was given the emotionless demeanor of Number One and promoted to first officer. Nimoy would go on to craft much of the backstory of Spock and Vulcan culture, including the v-shaped hand gesture accompanying the phrase “live long and prosper.” Hunter was unwilling to reprise his role as he wanted to focus on a movie career, and he was eventually replaced by William Shatner as Captain James T. Kirk (initially the “T” was an “R”). Pilot director James Goldstone cast his friend James Doohan as Chief Engineer Montgomery Scott, who was named after Doohan decided he could best pull off a Scottish accent. George Takei was cast as Lt. Hiraku Sulu, initially the ship’s physicist but changed to a helmsman for the series. Rounding out the cast was Paul Fix as the ship’s doctor, Mark Piper, Paul Carr as navigator Lee Kelso, Lloyd Haynes as Communications Officer Alden, and Andrea Dromm as Yeoman Smith. Screened almost a year after the first pilot, NBC was satisfied with the presentation and ordered it to series. The first regular episode, “The Man Trap,” debuted on September 8, 1966. Along with new uniforms for the crew, several cast members were changed. Piper was replaced by Dr. Leonard McCoy (DeForest Kelley, who was originally considered for the Piper role) while Kelso’s duties were taken over by Sulu. Alden was replaced by Lt. Nyota Uhura (Nichelle Nichols) and Yeoman Smith was replaced by Janice Rand (Grace Lee Whitney). Barrett would go on to rejoin the cast as Nurse Chapel in the 4th episode, “The Naked Time,” as well as portray the ship’s computer voice (a role she had in almost every Trek production that followed), and Sulu would be joined by Pavel Chekov (Walter Koenig) at the helm in the second season. 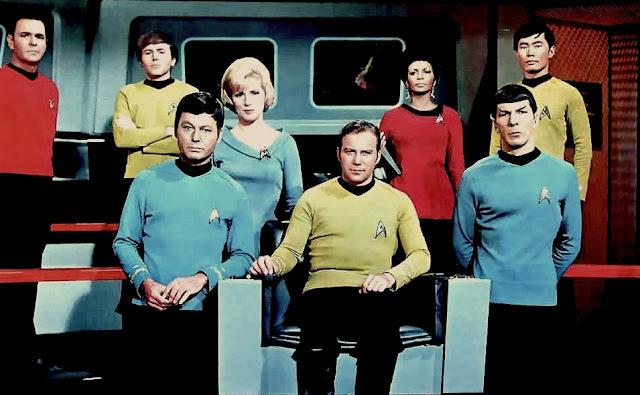 Star Trek (later known as Star Trek: The Original Series) enjoyed high ratings at the start of its first season, but they fell dramatically towards its conclusion. It was sufficient enough to warrant a second season, but NBC threatened to cancel it after that year. Science-fiction superfan Betty Jo Trimble (also known as Bjo) led an unprecedented letter-writing campaign to petition the network to keep the show (she also led the campaign to have President Gerald Ford change the name of the first NASA space shuttle to Enterprise, whose dedication was attended by the Trek cast in 1976). It worked, and NBC renewed it for a third season but at a substantially reduced budget. Roddenberry protested by resigning as producer and reducing his direct involvement in the series, leading to Fred Freiberger taking over his duties for the season. Despite another letter-writing campaign, NBC cancelled the show after 79 episodes. The fan mail just keeps pouring in. Sometime after its cancellation, Paramount Studios bought the show from Desilu and licensed the broadcast syndication rights to recoup production losses. Reruns began airing in the fall of 1969 and reached over 200 domestic and international markets. As a result, Star Trek was discovered by a new fanbase (soon to be known as Trekkies) and gradually achieved a cult following that rivaled its popularity during the original broadcasts. That culminated in the first Star Trek convention in January of 1972. While it was only projected to get a few hundred attendees, it ended up attracting several thousand. Paramount took notice of the series’ newfound appeal and toyed with the idea of bringing it back. They decided to test the waters with an animated series and contracted Filmation to produce it (Lou Scheimer, one of the founders, was a fan of the original series). While giving assurances that the cartoon would look and feel like original show, Filmation wanted to pair up all the crewmen with young cadets in order to have a larger appeal to children. But Roddenberry refused to give up creative control and allow it, so the idea was abandoned and later recycled into the series Space Academy in 1977. 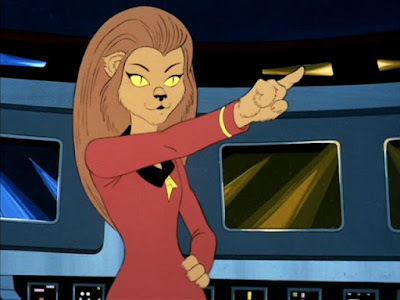 Roddenberry also insisted that D.C. Fontana serve as the cartoon’s story editor as she had been on the prior show, as well as be a producer. Roddenberry would be on hand to approve or change things in the scripts. Running a starship doesn't really require much movement. 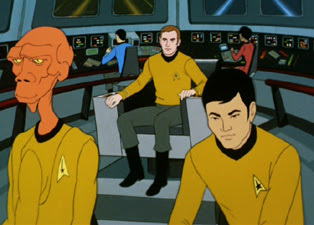 The writers of the cartoon would follow the same series bible used for the original series, and the use of animation afforded them the opportunity to introduce larger alien landscapes and less humanoid-looking aliens for the crew to encounter. However, like other Filmation projects, budget constraints and the fact they were producing several other shows at the same time often led to extreme cost-cutting measures. These included a liberal use of stock shots both created for the series or from other Filmation shows, or constantly recycling animation from previous episodes. While the majority of the animation quality was only fair with a number of errors, some parts of various episodes would achieve a near-theatrical level of quality. Typical production turnaround for an episode was three months. 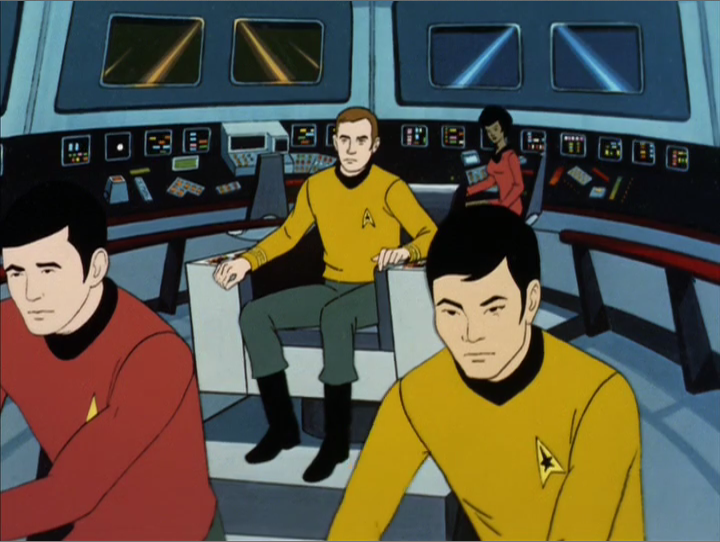 The animated crew of the Enterprise. Filmation planned to only use Shatner, Nimoy, Kelley, Doohan and Barrett to reprise their roles, with Doohan and Barrett taking over the voices of Sulu and Uhura, respectively. Knowing that his fellow cast members were having trouble finding work since the end of the series and feeling that Sulu and Uhura were crucial for the proof of ethnic diversity in the 23rd century, Nimoy refused to lend his voice to the project unless Takei and Nichols were cast. The budget wouldn’t allow for Koenig to reprise his role, although he was asked to audition for a small part. He did make a contribution by writing the episode “The Infinite Vulcan,” becoming the first Trek cast member to write a Trek story. The producers liked his work and invited Koenig to write another episode, but after the arduous process of rewrites demanded by Roddenberry and his own hurt feelings over being excluded from the show (he only learned of its existence during a Trek panel at a convention), he declined. 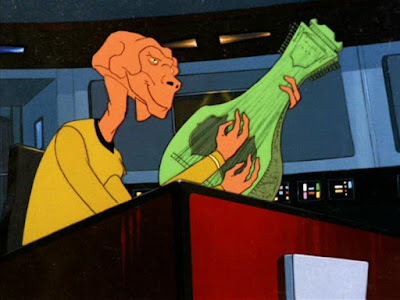 In Chekov’s place were two new alien characters: Lt. Arex (Doohan), an Edosian with three arms and three legs, and Lt. M’Ress, a cat-like Caitian (Barrett). The majority of the additional voices were handled by Doohan and Barrett, with Nichols providing several herself. A few guest stars from the original series did reprise their respective roles for the cartoon, including Mark Lenard as Sarek, Roger C. Carmel as Harry Mudd, and Stanley Adams as Cyrano Jones. While the initial episodes were recorded with an ensemble, other commitments made it so some of the actors would have to record their dialogue wherever they were and send them in to be spliced together onto the episode’s soundtrack. 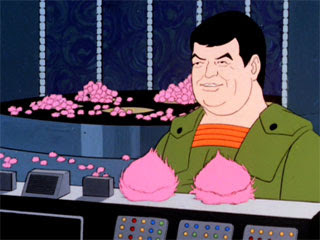 Cyrano Jones returned with even more Tribbles. The series’ writing stables benefited from the Writers Guild of America, West strike of 1973, which didn’t affect animated projects and allowed them to make use of the freed-up writers. Many of the original show’s writers contributed to the cartoon; either writing new stories or sequels to earlier episodes. Amongst them were Peeples, Fontana, Marc Daniels, Margaret Armen, David Gerrold and Paul Schneider. Science fiction author Larry Niven even adapted his short story “The Soft Weapon” into the episode “The Slaver Weapon.” James Schmerer wrote a single episode for the cartoon, “The Survivor,” on the basis that he was made to understand it would be geared towards adults like the original show and not children as his previous dealings in animation had been strenuous. The scripts for the cartoon featured a lot of call-backs to the original series, as well as maintained the same kind of heady storytelling quality with deep stories and morality tales. 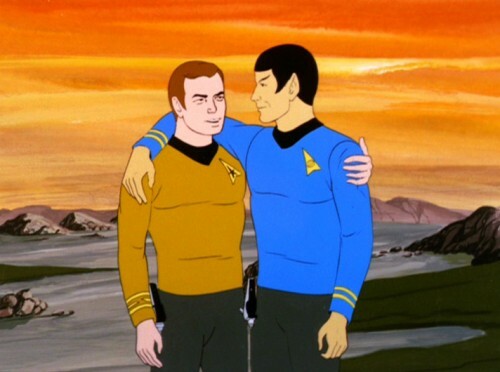 Despite the number of women on the show, Kirk's romantic life was on hiatus. Although it was produced with prime time in mind, NBC decided to place it on its Saturday morning lineup when it bought the show; further restricting the production on the kind of content they could use. The series debuted on September 8, 1973; exactly seven years after the premier of the original series. While “Beyond the Farthest Star” was always intended to be the series premiere, some markets shuffled the airing order to show “Yesteryear” first. The reason behind that was at the time Takei was running for a seat on the Los Angeles City Council, and in order to avoid violating the FCC’s equal-time rule (wherein any radio or television station had to provide the same amount of air time for any and all political candidates if they requested it) they chose to stop airing reruns of the original series and aired an animated episode that didn’t feature Sulu. 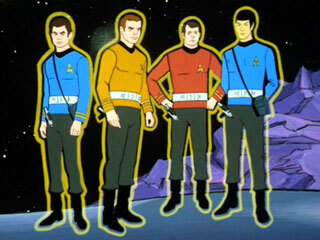 The series retained the regular Star Trek naming on its title screen (with The Animated Series or The Animated Adventures of Gene Roddenberry’s Star Trek added in later references to distinguish the two shows), but Filmation opted to use a new opening theme composed by Ray Ellis (under the pseudonym Yvette Blais) and Norm Prescott (credited as Jeff Michael). It was the first Trek series to also do away with the cold open and began with the opening intro (not counting the United Kingdom airings of the original series, which moved the cold open after the credits). An anti-pollution public service announcement was created in partnership with Keep America Beautiful and was played throughout the series’ run. Aside from the new crew members, the cartoon introduced several unique elements to the Trek mythos. It was the first series to have the holodeck (called the “Rec Room”), a room on the ship that could create three-dimensional and interactive holograms of almost anything that can be programmed. It wouldn’t become a Trek feature until the follow-up live-action series The Next Generation. There was also personal force field technology located in a life support belt, which allowed the crew to journey out into space. The belt and a glow were added to the character that wore them, saving the animators the trouble of designing and drawing environmental suits for the characters. A version of the belt would be used in an early The Next Generation novel titled The Peacekeepers. It also became the first Trek show to show a different class of Federation starship besides the Constitution class of the Enterprise. 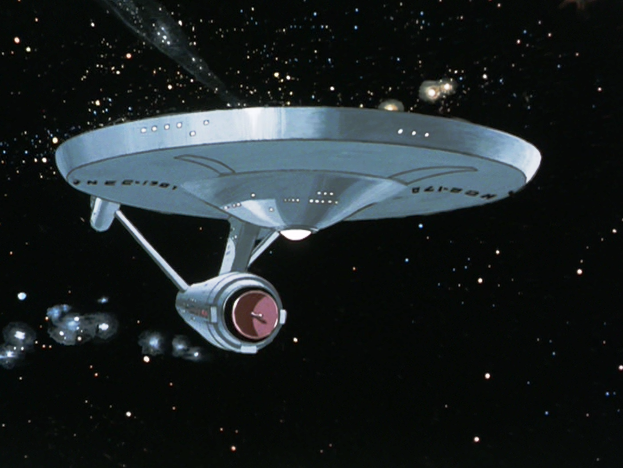 “The Time Trap” had the crew come into contact with the first starship to have a warp drive installed, the S.S. Bonaventure (also its class name), which resembled the Enterprise except with bulkier warp nacelles and a shorter saucer section. Even giant Tribbles couldn't bring the kids on board. The series proved unpopular with children, who were the main target demographic on Saturday mornings, and not as many adults watched during that period. However, it did receive critical acclaim as well as a Daytime Emmy Award for the episode “How Sharper Than a Serpent’s Tooth,” the first of the franchise outside of technical awards. That was used as a justification for the show to get a 6 episode second season, becoming the first Filmation program to do so on NBC. Reruns from the first season played alongside the new episodes. The second season premiere, “The Pirates of Orion”, was written by Howard Weinstein who had adapted it from a short Trek story he had published in the fanzine Probe. The script was taken on by agent Bill Cooper, who was a schoolmate of Weinstein’s father, and sent it to Fontana. However, since she had left the show, it was returned. The script was resubmitted and Weinstein was contacted by Scheimer who would buy the script if the ending could be modified. Weinstein agreed and the episode was made, making him the youngest Trek writer (19 at the time), the first to introduce the male Orions, and opening the door for Weinstein on future Trek projects. After the abandonment of an attempt to produce the first Trek movie, The Planet of the Titans, Paramount and Roddenberry began work on a new live-action series called Phase II. It was intended to be the flagship program for Paramount’s new television network, the Paramount Television Service, which was hoped to become the fourth television network (there were only three at the time). However, when the plan fell through the show was ultimately cancelled (Paramount would eventually get their own network from 1995-2006, called UPN). When Star Wars and Close Encounters of the Third Kind became box office successes in 1977, Paramount revisited the Phase II idea and decided to recycle the pilot’s plot into Star Trek: The Motion Picture. The entire original series cast was reunited in live-action, and would be for five more movies. "See? I told you one day they'd love us." In the meantime, Roddenberry was hard at work bringing Trek back to television. This led to the creation of The Next Generation in 1987 as a first-run syndicated show following a new crew on a new Enterprise. It would be the first of four new programs, most of them under the stewardship of Rick Berman after Roddenberry’s death in 1991, plus a new series of movies based on The Next Generation. 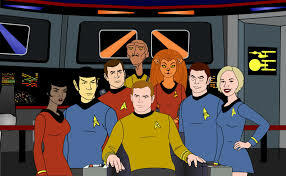 At the completion of The Next Generation’s first season, Roddenberry’s office rendered the animated series non-canonical in Trek lore. However, while events from the cartoon were not explicitly mentioned, elements from various episodes such as character moments, alien races, ship names and characters themselves found their way into the programs, novelizations, video games and movies. In 2007, the cartoon was made part of the official canon when it was included in Star Trek’s official site library, with both Fontana and Gerrold regarding it as the long-desired fourth season of the original series. The series novelization, vol. 5. 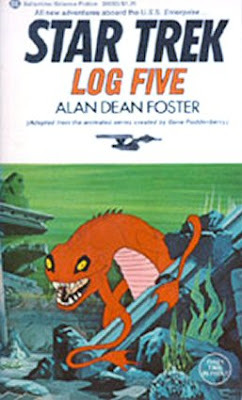 All of the episodes were adapted into story form by Alan Dean Foster in ten volumes of Star Trek Logs by Ballantine Books. Initially, Foster featured three episodes per book, but the later books featured singular episodes expanded into full-length novels, sometimes with additional bonus original stories. Tuttle Enterprises would release a series of animation cels taken from the show. “Yesteryear” was reproduced as a View-Master set titled “Mr. Spock’s Time Trek.” In 2003, Rittenhouse Archives released The Complete Star Trek: Animated Adventures Trading Cards set. The complete series was released to VHS by Paramount across eleven volumes in the United States, while the United Kingdom got theirs across seven volumes in 1992 by CIC Video. An Australian release was planned but never materialized. The complete series was released on laserdisc in 1990, and re-released in 1997. 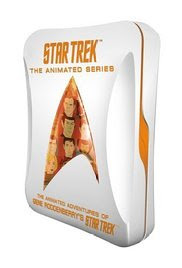 The complete series came to DVD in 2006 in a special tin package, becoming the last Trek series to be released on that format. The international versions soon followed. Ten years later, the complete series would be released to Blu-ray for the first time. In 2011, the entire series was available to stream on Netflix. “Beyond the Farthest Star” (9/8/73*) – Trapped in the orbit of a dead star, the crew discovers an ancient ship trapped there with them. *Aired 9/15/73 in some markets. “Yesteryear” (9/15/73*) – Spock travels to the past to rescue his younger self. *Aired 9/8/73 in some markets. “One of Our Planets is Missing” (9/22/73) – The crew has to protect Mantilles from a cloud creature that feeds on planetary energy. “The Lorelei Signal” (9/29/73) – Investigating starship disappearances leads to the discovery of a race of beautiful women. 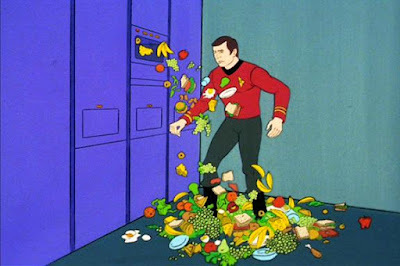 “More Tribbles, More Troubles” (10/6/73) – The crew has to protect two ships of grain and Cyrano Jones from the Klingons. “The Survivor” (10/13/73) – The crew discovers a ship manned by a philanthropist who disappeared five years prior. “The Infinite Vulcan” (10/20/73) – Sulu picks up a walking plant on an away mission and ends up poised by it. “The Magicks of Megas-tu” (10/27/73) – The ship ends up stranded inside an energy/matter vortex until Lucien appears, repairs it, and takes them to his planet. “Once Upon a Planet” (11/3/73) – The crew returns to the amusement park planet for some rest. “Mudd’s Passion” (11/10/73) – The crew is ordered to arrest Harry Mudd for selling fake love crystals. “The Terratin Incident” (11/17/73) – A message in an ancient code finds the ship while they observe a burnt-out supernova. “The Time Trap” (11/24/73) – Investigating ship disappearances leads the crew to be attacked by Klingons and sucked into a spacetime vortex with one of the enemy ships. “The Ambergris Element” (12/1/73) – Argo’s inhabitants turn Kirk and Spock into water breathers, leaving them needing to capture a snake in order to revert back. “The Slaver Weapon” (12/15/73) – The Kzinti attack the shuttlecraft transporting a stasis box to Starbase 25. “The Eye of the Beholder” (1/5/74) – The crew investigates the disappearance of a scientific team near Lactra VII. “The Jihad” (1/12/74) – The crew has to prevent a holy war by investigating the theft of a religious artifact. “The Pirates of Orion” (9/7/74) – The crew must encounter pirates for the cure to Spock’s illness. “Bem” (9/14/74) – The crew is taken captive by natives to a newly-discovered planet. “The Practical Joker” (9/21/74) – The ship’s computer plays practical jokes on the crew, which gradually become more dangerous. “Albatross” (9/28/74) – Bones is arrested for causing the plague that ravaged planet Dramia. “How Sharper Than a Serpent’s Tooth” (10/5/74) – The crew has to solve a puzzle or be destroyed. “The Counter-Clock Incident” (10/12/74) – The ship is pulled into a universe where time runs backwards.